There is a wide variety of air compressors and each one fulfills a specific purpose. This article will help you in choosing the best air compressor for your intended use while helping you save money from over buying on features you don’t need. 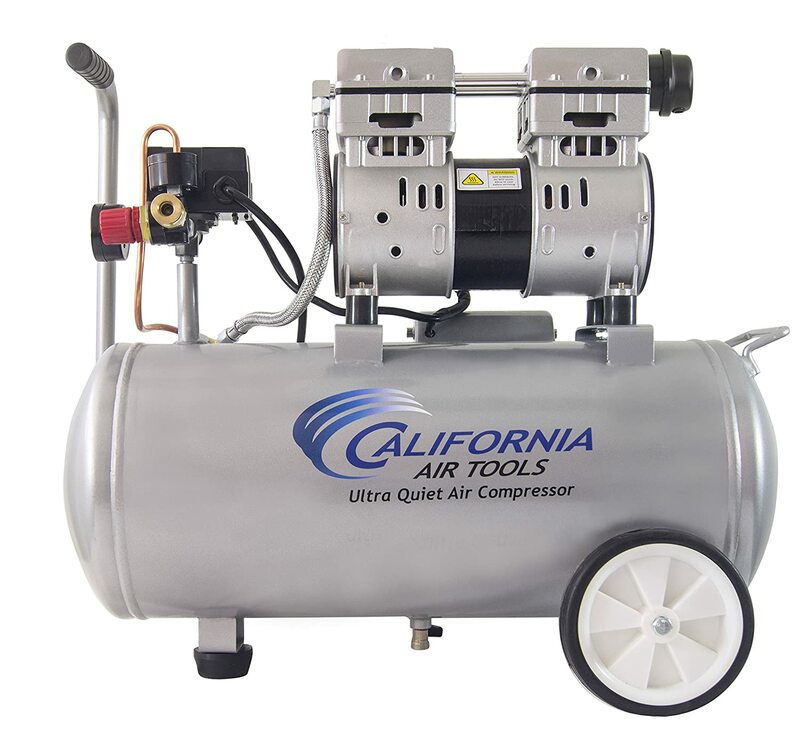 Ideally, you will want an air compressor that is easy to use with low maintenance. If a pancake compressor can do the job then lugging a 220 volt 60 gallon air compressor to the job site is going to be counter-productive. (It also isn’t quiet enough to keep the neighbors happy.) Tool Tally reviews make it easy! If you are in a hurry, you can scroll down to our comparison chart of the best air compressor. I also have a buying guide for those of you who need more in-depth information on each compressor. And, finally, I’ve summarized with my picks of the best air compressor for your garage/home use, for your shop, and for the jobsite. If there is a model that interests you, I provide an in-depth review on its strengths and weaknesses as well as common complaints that we discovered in our testing or that are commonly referred to in forums online. 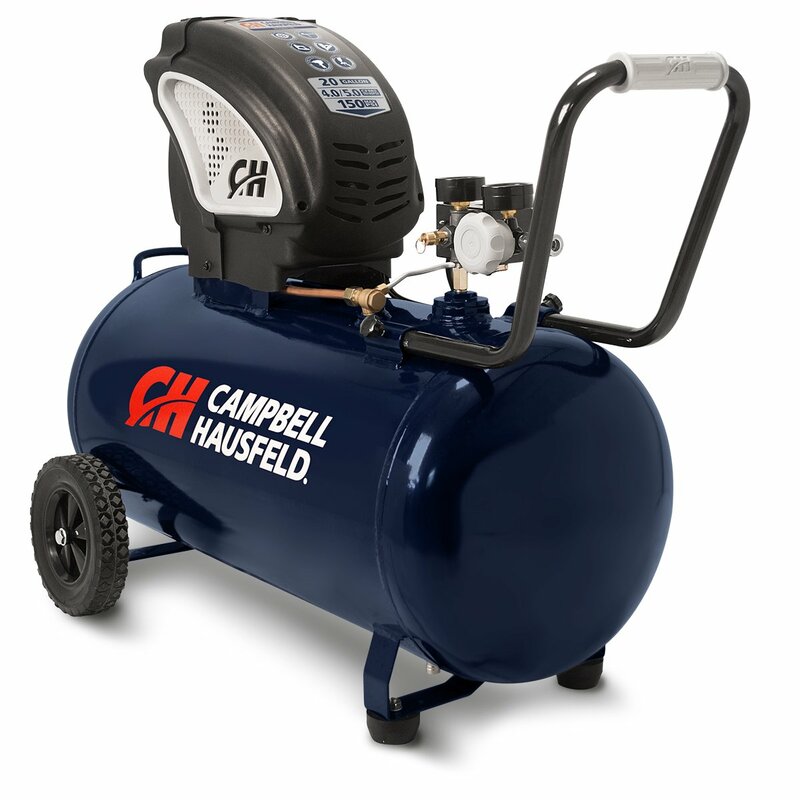 My goal is to help you find the right air compressor that will last a long time, while shortening your shopping process from days to, at most, hours. We also have reviews on 12v portable air compressors, 20 Gallon Compressors, 30 Gallon Compressors and 60 Gallon Compressors. Don’t forget to buy a hose to go with your new air compressor. This chart is handy if you know what size compressor you need. If you don’t know, check out our air compressor sizing guide (opens in a new tab) and then come back to this article. Oil Lubricated design is good for long run times with no maintenance. Ideal for: Professional contractor use. Most of the competing blogs (and many of the contractors in your area) are going to favor the oil-free compressors. They are lighter and require no maintenance. However, I’m old-fashioned and I like my tools to last a long time. I want to be able to run hard and fast and get to the next job site as quickly as possible. Time is money, and I don’t need to be waiting on my air compressor. That is why this Makita scores more highly for me. It is just a little heavier, but brings a quieter and more robust operation to every job. The MAC700 uses the Big Bore pump cylinder and piston in a cast iron casing. This bigger bore means that it runs at 1700 RPMS – half the speed of many of the units on this list. This lower speed means that it only draws 12 amps, and with it’s gentle startup it results in fewer tripped breakers (and burnt out motors) and more time working. At 80 decibels, it isn’t the quietest in this list, but it is sufficiently quiet to use on remodels where homeowners are going to be present. Honestly, it has less of that annoying high-pitched “tack, tack” noise of some of these machines and it seems much quieter than it’s rating in real life. It is going to be heavier. At 59.6 pounds, you are going to me a special trip just to get this compressor (and you might wheel it out on a dolly). Because it is an oiled unit, you can run it continuously. Running your nail gun hard and fast for roofing, framing and flooring jobs and even for LVLP sprayers. The downside is that it only has one outlet, and is designed for one nail gun to run at a time. I feel that, compared machines like the Dewalt DWFP55130 reviewed below, that this one is even more adequate for running two guns at once, but I guess Makita got tired of fixing warranty claims on all of the guys who finally found the limits of the machine. If you want to run two nail guns, I’d upgrade to the MAC 2400. It’s all the features we love in the MAC700, and only weighs 21 pounds more, but is designed for running two nailers simultaneously. Otherwise, the MAC700 is the best small compressor you could ever own. Ideal For: Fast-paced professional use. The Makita is hard to beat but this Rolair gives it a run for its money. With 45 years of manufacturing history, the Rolair is no newcomer to the game. In my opinion, you don’t pay as much for name-recognition and you are investing more into the value of the compressor itself. You are looking at an absolute workhorse of a machine. With 2.0 horsepower, this unit delivers portable all-day air power. You get 4.4 CFM which is enough for impact wrenches and for running two nailers at a time. If you have a lower-volume paint sprayer it should be able to spray paint and lay drywall. What puts it into the second position is its massive motor. It draws the full 15 amps, so you need to keep it near an outlet and use a shorter extension cord (tip:buy a longer air cord). This means that if you are working in an older house with poor circuits, you might find yourself fighting the circuitry some. 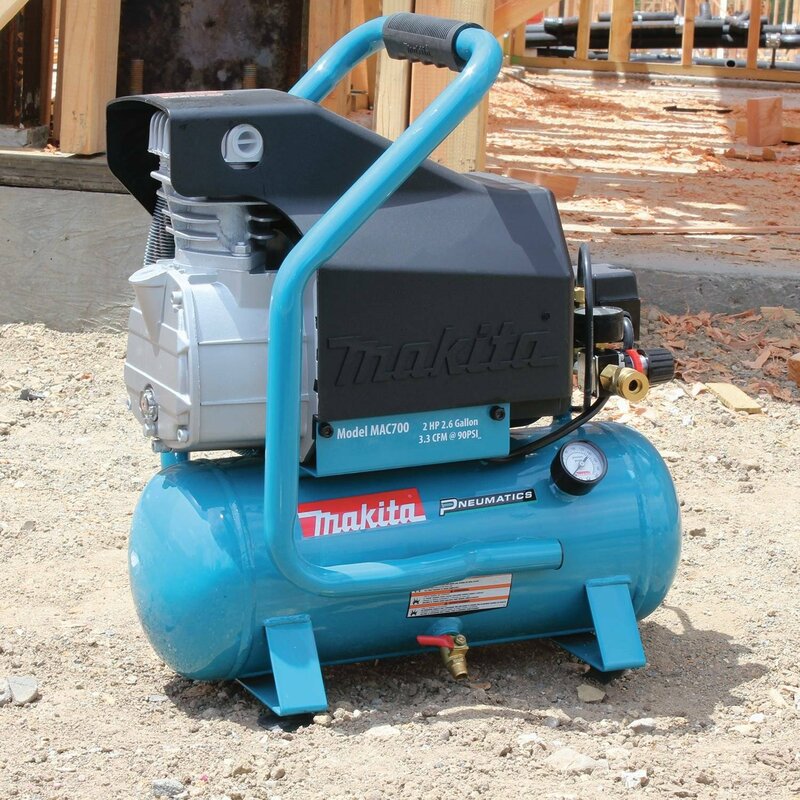 But for a 100% duty cycle compressor that is still light and portable, this one and the Makita are my two top picks. This one is a little lighter and delivers more CFM, making it the better value. But the Makita’s track record is hard to argue with. If you want to run two nailers or do any spraying (drywall or low-volume paint), this might be a better one to go with. Ideal For: Honda Motor provides portable compression where electricity is not available. Great for farm use and a favorite in some Amish communities. This one is an “odd bird” and I’m not sure where to put it. While most of the compressors on this list use a 120v electrical motor, this one is powered with a gasoline motor which puts it into a separate category. If you are working on a job site which doesn’t have electricity, this unit is the one you need. It’s also more powerful than most of the units on my list. The 5.0 SCFM capacity of this unit means if is capable of running air impact wrenches, which makes this one a consideration for using on roadside service calls where you need to swap semi truck tires on the side of the interstate or repair a tractor in the back 40 acres of your farm. It is also a lightweight unit at 76 pounds, and comes with handles that make it feasible for one person to move it around or to use a two wheel dolly to move it from spot to spot. A lot of folks just leave it in the back of their truck or their trailer as they move from job to job. The 5 Horsepower Honda engine is going to run all day with now issues. Just check the oil levels and you are good to go. Keep in mind that it doesn’t start if there is air in the tank. So drain your air tanks before you try starting it. Despite being such an awesome machine, it is definitely designed for that specific scenario where you need a lot of air power and don’t have access to electricity. There are more maintenance considerations since it is powered by a gasoline motor, so this isn’t a situation where you want to choose this option for the greater versatility. Only choose it if you regularly need air pressure in areas inaccessible by electricity. Ideal For: Small to medium jobsites. Perfect for the home DIY. The Dewalt DWFP55130 should be one of the top, go-to considerations for jobsite contractors who need highly portable compressors. 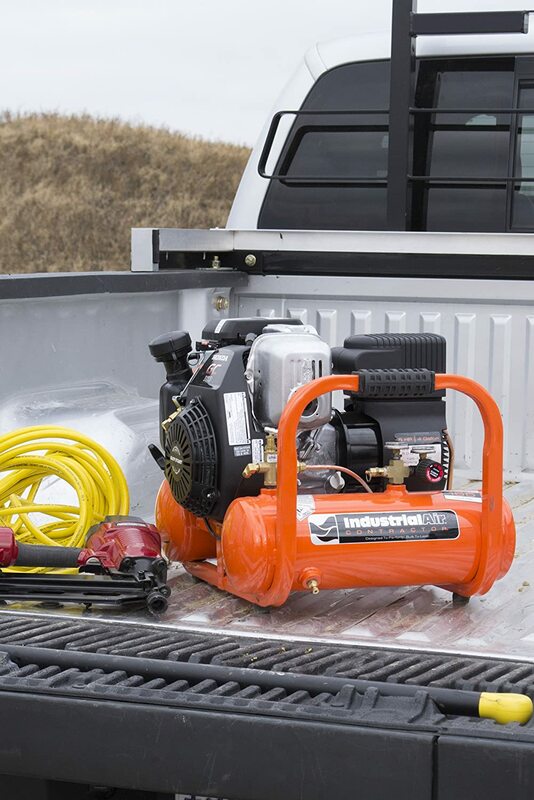 The Oil-free design makes this a perfect compressor for throwing into the back of your truck without worrying about it leaking. It also means that it has very few maintenance requirements. The motor only draws 12 amps which means that this will work with pretty much any extension cord. Even if you have to stick a couple of 25-foot cords together, you should still have enough power to not be overly wearing out the motor (low amperage can cause cords to short out, breakers to trip, or faster burning out of the motor). This makes it ideal for job sites where you need to work around residential circuits. The 90 PSI Pump delivers 3.0 CFM which is a too low for tasks like sandblasting, but high enough for intermittent use of a cut-off grinder or an impact wrench. However, this compressor is specifically designed to run air nailers. At only 71.5 Decibles and 36 pounds, this is a perfect unit for building in industrial areas without drawing too many complaints. It’s also great for one handed carrying to and from the job site. The oilless design does mean that you want to keep this compressor at 50% of the duty cycle. In other words, it needs to rest for as long as it runs. The 2.5 Gallon tank should make that happen, but if you have two guys running guns as fast as they can (flooring or roofing), you are going to be stressing it out, and I’d go with a bigger system. For all other uses, the maintenance-free pump design is a blessing. This is an excellent system for the solo contractor and the contractor who is getting started. 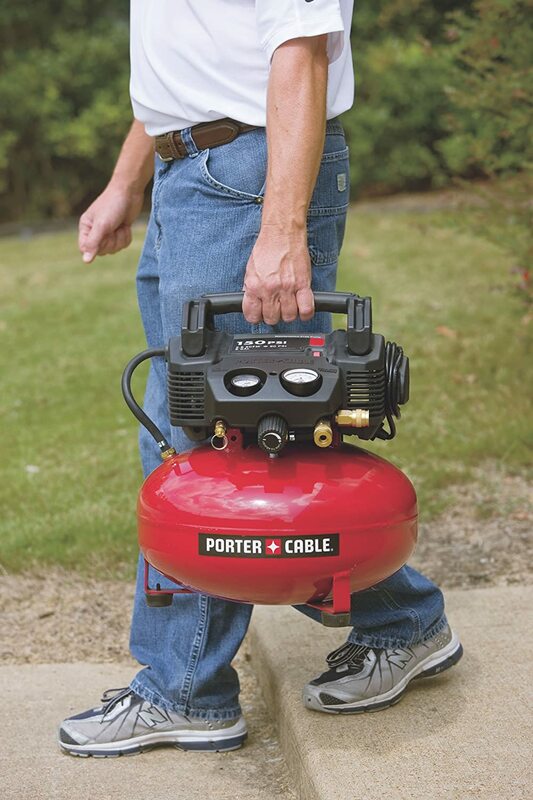 It’s extremely robust for the DIY homeowner who wants a compressor with a little bit extra power. 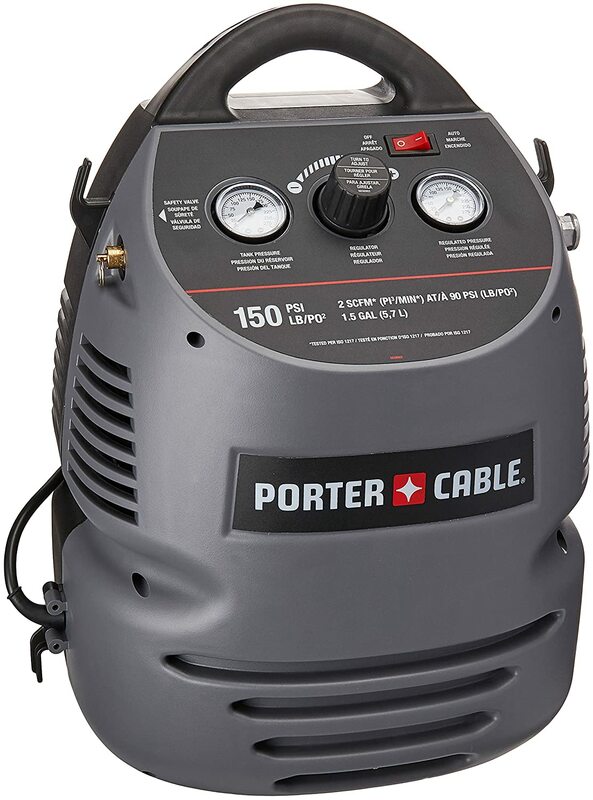 For the construction team that is looking to run two tools from the same compressor, and who would struggle to let it rest for 50% duty cycles, you need to bite the bullet and go to an oiled compressor (or buy two of these to split the load). 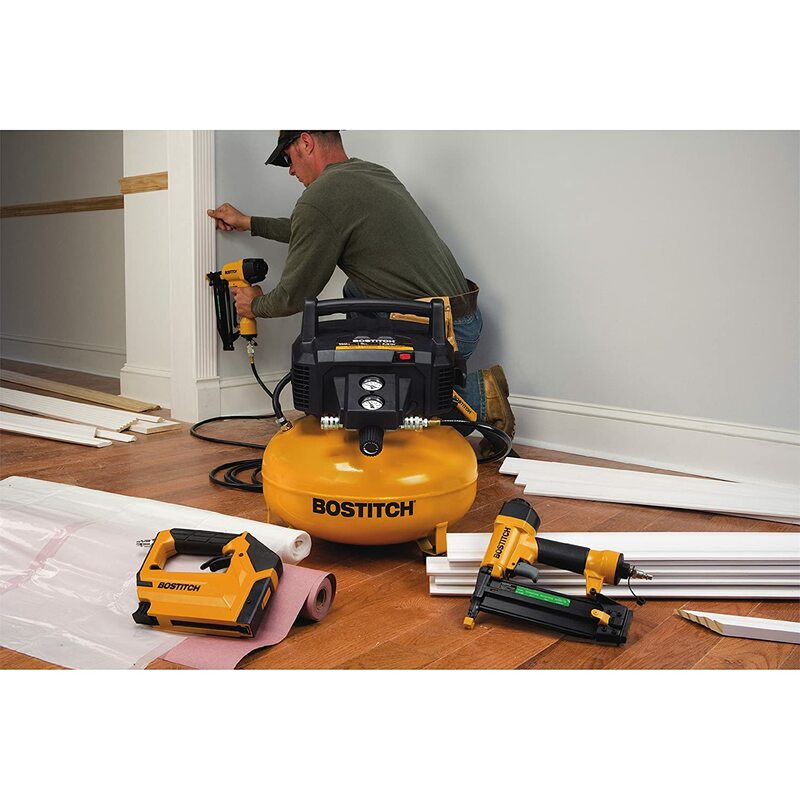 This Bostitch is designed for the homeowner who needs an air compressor and some nailers. For one affordable price, this combo kit offers everything that you need to do just about any home remodeling project. From framing to finishing, this kit has you covered. The only thing you wouldn’t have is a roofing nailer. You’re getting an oil-free compressor which means that it doesn’t need maintenance. This also reduces the risk of it leaking oil especially if it gets knocked over. At only 43 pounds, it is super easy to carry around the house from task to task. The 15 amp power is a higher power draw than many of them on this list. The good side of this is that you should have plenty of air pressure and more air than you can use. However, you will need a heavier gauge and shorter extension cord to support this draw. If you put this on a 50 foot extension cord you will burn out the motor faster from that power drop. (Not: Bostitch does not provide a horsepower rating for this unit. I’ve reached out for comment on this). Because it is a 15 amp draw and most house circuits are only 15-20 amps, you don’t want to plug it in on the same circuit your refrigerator is on, or you will flip the breaker. For the homeowner, those are easy work-arounds. If you were a contractor who needed an all-in-one kit to get you through your first few jobs so you could afford better equipment, this unit would be a great choice. With 6 gallons of air, it won’t be running all the time and I would expect it to withstand a year of daily use. I have a buddy who has been running this one for two home builds. The second house just wrapped up and his compressor is still running, but more weakly and is ready to be replaced. But where it really shines is for the homeowner and crafter who wants professional pneumatic power for an affordable price. I love the pancake compressor. It is lightweight and easy to move from jobsite to jobsite. 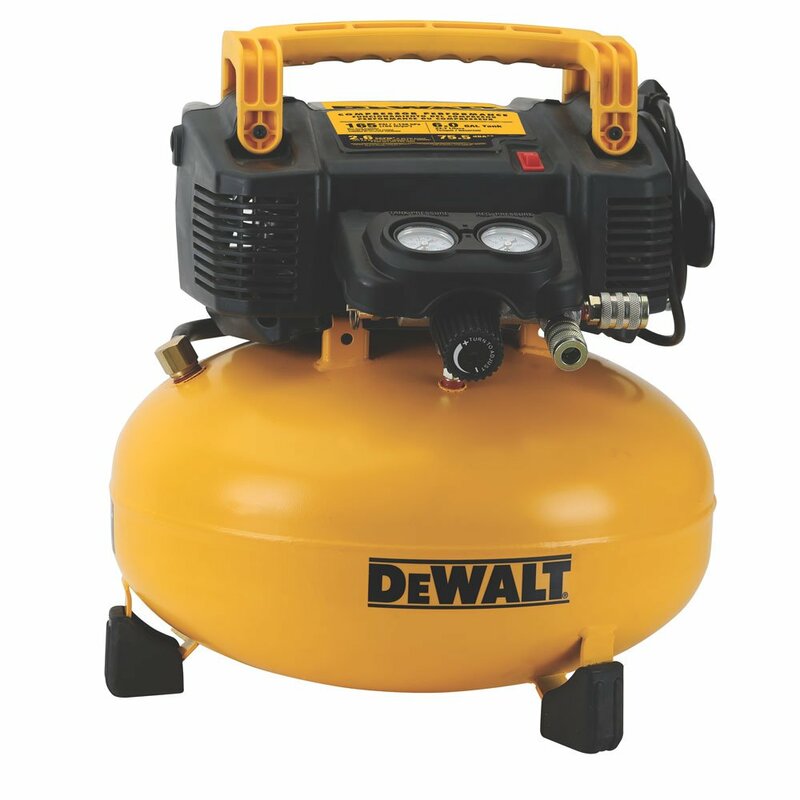 This Dewalt is also ideal of those of you who need an emergency backup unit or need a cheap compressor that you can send to a second site while the crew works on the main compressor. At 165 max PSI tank pressure, you aren’t hurting for power and the 6.0 Gallon tank means that this unit takes long breaks between running while you and a buddy pound away on your project. If it had a bigger motor, I almost prefer this unit over the Dewalt DWFP55130, since I like my compressors taking breaks. And, when it does kick on, the 75.5 Decibel means that it is on the medium to low noise level. Less noise than most of the compressors on this list. The motor is a little smaller with only .9 horsepower and only a 10 amp draw. 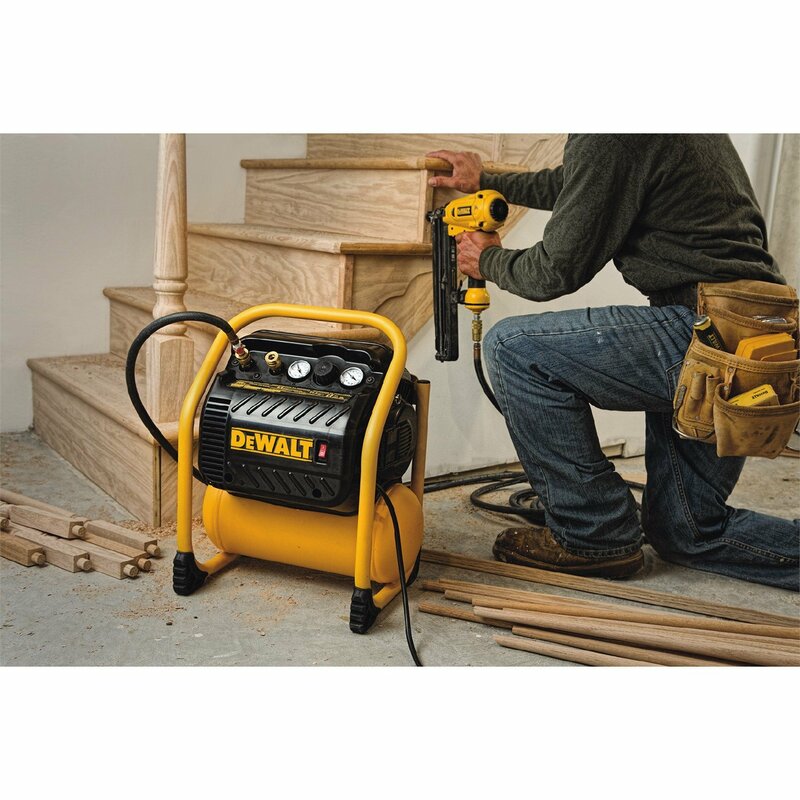 This is perfect for the jobsite compressor where you can give it plenty of time to recharge. With only 2.6 CFM, I wouldn’t be using this for any spraying jobs. It isn’t a good choice for impact wrenches. But most of you are looking to use it for construction, and you’ll be able to lay down 3 ½ inch nails with this guy. It’s great for inflating those bike tires, keeping the car tires topped off and for installing a floor on the weekends. If I were a contractor, I wouldn’t choose it as my primary construction tool, as there are so many other top contenders and this one fits into the secondary role so well. Here is another excellent little compressor. It is extremely affordable and also lightweight, which makes it great for leaving in the garage. You can even store it on a shelf until you need it. With 135 PSI, it has more pressure than most household jobs will require. As you expect, it is an oilless unit which means you never have to perform maintenance on it. Just plug it in and start using it. With only 2.0 CFM, it’s not going to be doing any spray painting or other continuous airflow tasks, but I don’t think that’s what you are likely shopping for. It is a little louder than some of the units on our list at 82 decibels. But I doubt you’ll be using it for long stretches of time. It is only a 3.5 gallon tank, so it will run more frequently. If you are using it for a weekend DIY project, don’t be surprised if the kids ask if they can go stay at Grandma’s while you do your handyman stuff. Looking at the ratings, you should be able to run a framing nailer on it, as well as anything smaller. If you are working quickly, you might need to wait occasionally for the tank to catch up. The one challenge with this pump is that a lot of homeowners pick it up as a high end garage air compressor. However, Porter Cable sells it as a contractor-level series so it does not come with any hoses or accessory kit. Plan on spending a little bit of money to pick up the needed parts before you do your first job. Bottom line is, this is a great unit for around the house that could pinch hit on the job site when needed. Dagnabbit! The low air pressure light came on for your tires again. Now you have to go stand in the freezing cold to fight the coin-fed pump at your local gas station. If you are tired of fighting with air pressure like the rest of the plebians, this one from Porter Cable is for you. It’s especially handy for keeping RV tires filled up. Ideal for home inflation use, you are going to find yourself using it monthly to air up your car tires and save money on your fuel usage (underinflated tires ruin your fuel economy). It is also easy for the kids to use to air up their bike tires so they will quit pestering you about that and the neighbor kids will always be bringing their balls over for a quick top-off before the nightly scrimmage. At 150 PSI, this one has more than enough power for all of these tasks, and the 2 CFM @ 90 PSI means that you aren’t waiting all day to get your larger volume tires filled up. It has a smaller 1.5 gallon tank, which is an advantage for the home user as you don’t have to wait as long for it to pressurize. The smaller air tank size also makes it lighter. It only weighs 20 pounds so you’ll be able to carry it around with three fingers. For those of you who are the family fixit guy, It’s great for throwing into the back of the car to go air up your sister’s or your mom’s tires. It is an oilless unit so no maintenance is required. While probably not designed for it, this compressor is rated high enough to run a brad nailer and possibly a framing nailer on it. The CFMS are going to be too low for it to perform well with an impact gun, and you will absolutely burn it out if you try using it for high volume applications (short air bursts are fine, though). This is an ideal compressor to buy for the newly-married couple and is the bare minimum that every homeowner should have. The best part? It comes with a hose and all the basic inflation accessories you need. I love it when big things come in small packages, and I would pick this unit over the Porter Cable reviewed above. However it is rated a little lower in technical specifications, and so I’m going to slip it in here. There are a lot of things I like about it. Designed as a super quiet compressor, it is about 65 db from a foot away. For comparison, that is about as loud as human conversation. This is a compressor that you can easily carry on conversations around. It is also a lightweight unit. Using an oilless design for low maintenance and light weight and a 1 gallon tank, this little unit only weighs about 20 pounds. You’re going to wake up looking forward to using it every day. While you can use it to keep your tires aired up, the CFM (air flow) is low enough that you might be frustrated waiting for larger RV tires to air up. It’s great for car and truck tires, though. It is going to be a little small for framing nailing, since it will kick on with every 3-5 nails, and that rate of use is going to burn the pump out. If you are planning on adding a room or a deck, I’d hop back up to the Bostitch or one of the Dewalts above with that larger tank size. However, for airing up tires and for the crafter who wants to run their stapler or airbrush (not paint sprayer! ), or for the contractor who wants a super-quiet super-lightweight unit for finish nailing, this Senco is ideal. Campbell Hausfield has been one of the leaders in the pneumatic tool industry for decades. You likely recognize their name. The 20 gallon tank makes this one of the larger models on the list. However, it is only a 14 amp draw, which makes it suitable to plugin on any standard circuit. Because it is an oilless unit, you need to make sure that it gets plenty of rest time between running. You want to shoot for 50% duty cycles where it rests as long as it runs. Thanks to the 20 Gallon tank, that is quite doable. This unit is great for putting in your shop and running all of your tools off of it. You can use it for impact wrenches, cutoff wheels, low volume paint sprayers, nail guns (it should be able to run two at once) and more. 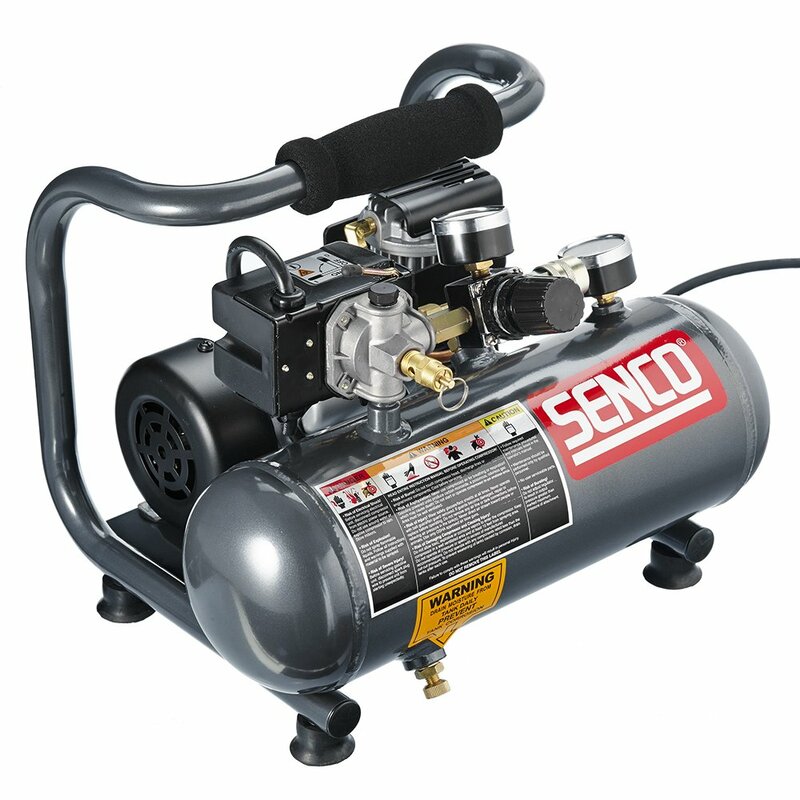 It is one of the most efficient and affordable shop compressors that you could invest in. The downside is that it loud. You might want to put up a wall and some insulation around it (provide plenty of clearance, check with the manufacturer, but provide airflow to keep it from overheating.). Ear protection is a good idea. But, for a cheap shop compressor, it is hard to beat. If you are worried that it isn’t robust enough, check out our list of 60 gallon air compressors. Ideal For: Home Garage Use and brad nailers. When you say “Air Compressor” this is the unit that comes to mind. My Grandfather had one like this in his garage where it powered his farm for 20 years. This a unique system that fills a more specific role and is likely to last a long time. However, the lower CFM and larger size means that folks often choose other compressors instead. While they have wheels, the size makes them hard to move from job site to job site. They are great, though, for moving around the shop and are more of a stationary air compressor compared to the highly-portable contractor units. The larger 8 gallon size is perfect for using all day with minimal noise interruptions from the compressor kicking on. While it has an oil-free pump, it does use dual cylinders which makes it a more high performance compressor that is more efficient with less wear. As a result, this one is rated for 3,000 hours of use instead of the 500 hours that many of the other units are rated at. 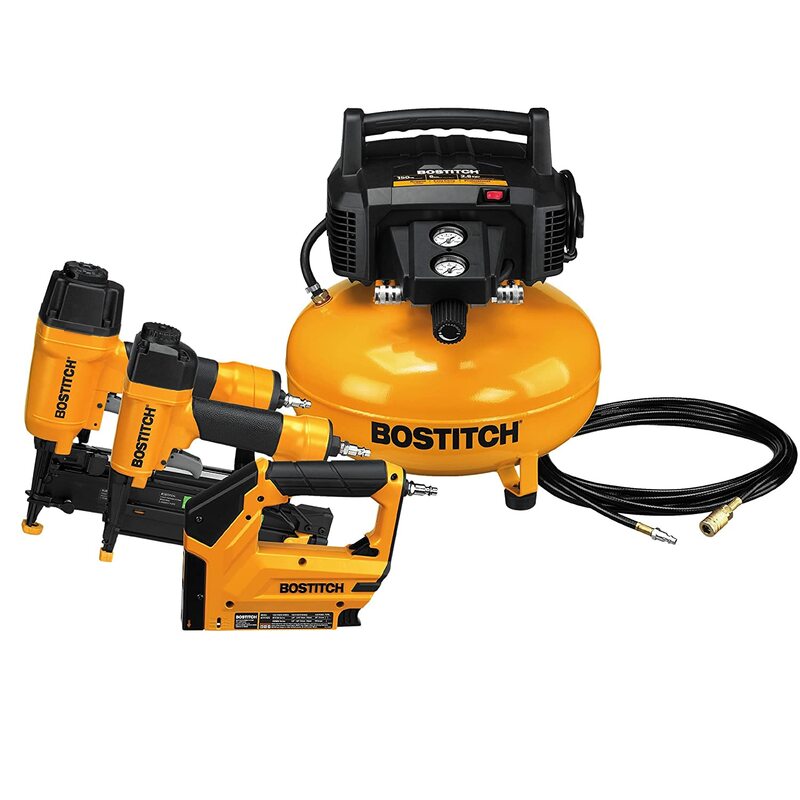 As with most of the units here, it is great for air nailers and for jobsite use. It is especially good for contractors who have to work around homeowners or who want a working environment that is as quiet as possible. It is not going to be good for sandblasting, painting or even running impact wrenches. When it does kick on, it is only 60 decibels, so you can easily talk over it. It’s not whisper quiet, but it is still one of the quietest compressors you can find. Where CAT 10020 excels in in the small shop setting. You want to start building cabinets or gazebos or whatever, and need to run a single nailer, but want a compressor that is going to last, and that isn’t going to be running all of the time. This compressor would excel in this situations. 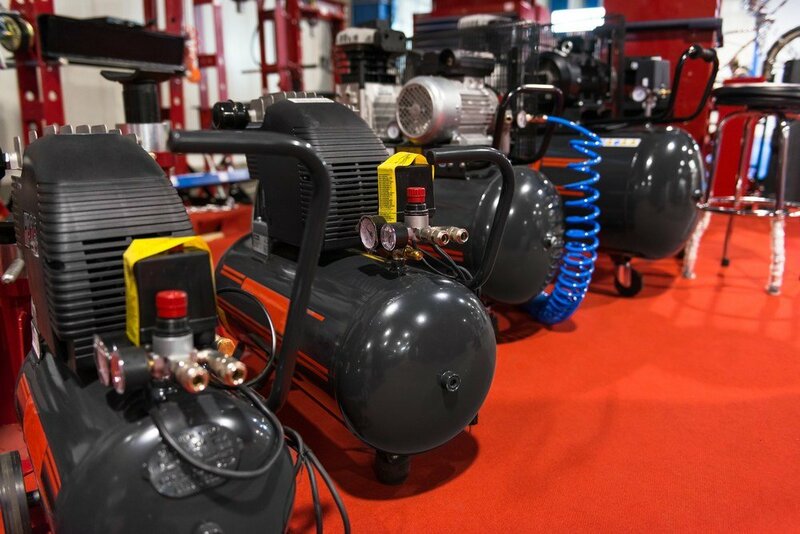 Even if you have been around air compressors, you are probably feeling a little overwhelmed by the offerings and features. In this short buying guide, I’m going to cover the key points that you need to be aware of. I also link over to articles that have more information in case you need it. The horsepower rating is what a lot of consumers look at when shopping for a compressor. It only tells part of the story. The motor drives the compressor. If you have a bigger motor, typically you can drive more air flow, and it is going to work better in cold weather when conditions are less optimal. A larger motor often means that you will have less wait time between depleting the tank and recovery. However, bigger isn’t always better. If you go with a big motor and are working on an old house, you might find yourself constantly tripping the breaker. The best contractor air compressors will typically offer a little less power in exchange for offering a lower amperage draw. A good shop compressor is probably going to offer a bigger motor for more reliability, but then you will likely want to have your compressor on a dedicated circuit to keep it from tripping breakers. Pounds-Per-Square-Inch or PSI is the core measurement of compression. 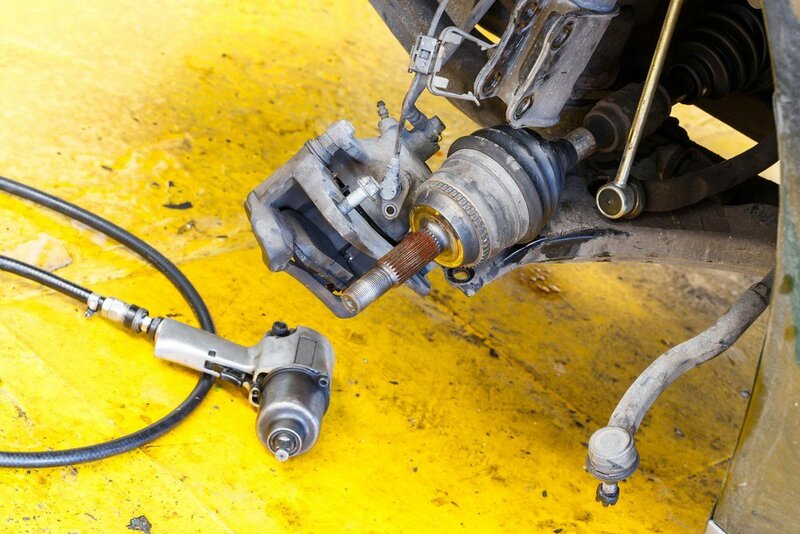 If you are just airing up tires, any of these compressors will work. They provide more than 30 PSI (or 80 PSI for RV and ATV tires) so you’ll have no problem using these tools for your goals. Road bicycles are a little weird in that they need about 120 PSI. But very few of you will need a compressor that high for air tires. Most of you will be matching your air pressure to your tool requirements. An air nailer will likely require about 120 PSI. As a result, you’ll want to make sure that your air compressor matches the 120 PSI. If you are running two nailers on one tank, you only need 120 PSI. but you do need more air flow, and that takes us to a discussion of CFM or air flow. CFM or Cubic Feet Per Minute is one of the most essential measurements of an air compressor. A nail gun is going to use about 2 CFM at 90PSI. So you need a compressor that can exceed that. Exceeding this is key. You’ll notice that most of the compressors on this list offer CFM ratings at 90 PSI. That is a pretty standard measurement. Based on the ideal gas law, when the pressure increases, however, the CFM – or rate of air flow – is restricted and the CFM decreases. Air compressor manufacturers know this. But it is something you need to be aware of. For example, the MAC700 is an amazing compressor that could probably power two brad nailers. But if you need to run a framing nailer with it’s massively higher CFM, you should only run one at a time. My sizing guide can help you figure this out. The tank size is your sanity. If you have a small tank, your compressor is going to need to kick on more frequently to air up the tank. The less your compressor runs, the longer it is going to last (and you’ll keep your hearing). Many of these contractor-sized compressors come with 2 or 3 gallon tanks. 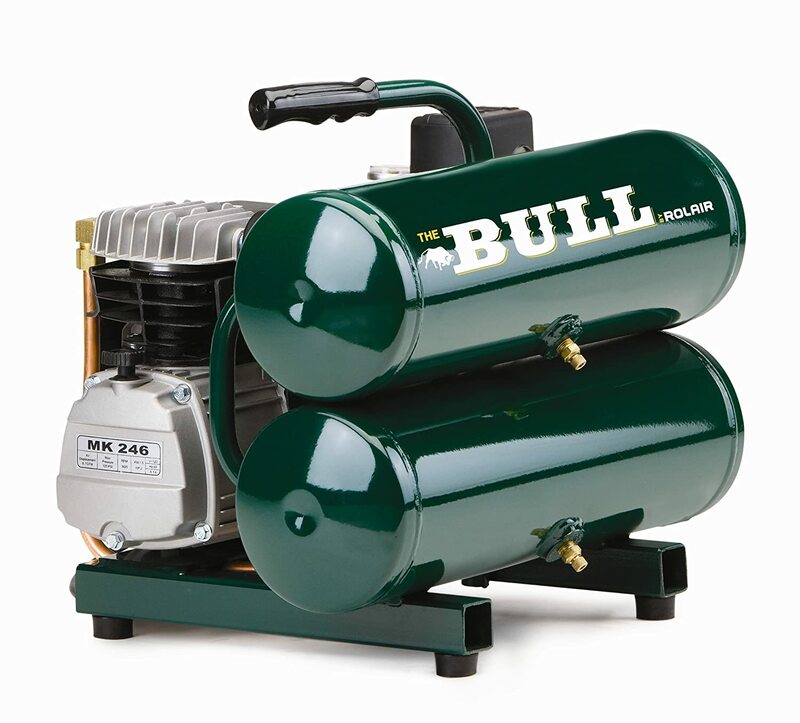 The advantages of these small tanks is that the compressor is easier to carry around. However, the compressors is going to kick on more frequently. The Bostitch above is a good example. It uses a 6 gallon tank so it can turn on less frequently. However, it also has a smaller motor, so it needs that bigger tank to compensate for the longer time it takes to refill with air. If you are doing tasks that require a large amount of air – such as spray painting cars – you’ll need a bigger tank. You likely also need a compressor that can run longer without stopping. Let’s talk about duty cycles. You’ll notice that most of the compressors offer oil-free or oilless compression. “Excellent! You think. No maintenance!” There is also the advantage that the machine can tip over in your truck or on a client’s floor and not leak oil all over the place. Oil is important. It helps machines operate cooler, longer and without wear. The thought with the oilless systems is that the compressor will have time to recover between sessions. It isn’t likely to run 100% of the time. It will run for a few minutes, fill up the tank, kick off, and wait for you to use enough air for it to need to fill up again. Oillless systems need to sit for an equal amount of time that they run. If you find yourself working ahead of the compressor, you might want to slow down so you don’t burn out your unit. For nailers. Oil-free rigs work well. However, for higher volume activities, such as running an angle grinder or sandblaster, you are going to be constantly depleting the tank and you need a compressor that can refill it and run for long periods of time (Even constantly). Choosing an oiled compressor provides you with that added ruggedness. You can rest assured that you and the boys can work as fast as possible, and the compressor will keep pace. Many of these oiled systems last for decades. You hear folks bragging about them. If you want durability, especially in scenarios where the compressors isn’t going to get a break, you need to choose an oiled system. If you have been around compressors much, you will notice that they are loud. Thankfully, most of the manufacturers provide ratings. Where ratings haven’t been provided by manufacturers we have used manually taken measurements from 1 foot away. These measurements are done imprecisely and are only estimates. As a result, use these measurements as a basic guide and always wear proper hearing protection. For reference, 60 decibels is a normal human conversation.Long exposure to sounds above 85 db can cause hearing loss. All of these compressors are either electricity or gasoline powered. For the sake of flexibility, we kept this list reserved to 120 volt compressors. However, if you need more power, you might need to step up to a 220volt unit. All of these compressors pull 10 amps or more and most pull 15 amps. As a result, you shouldn’t plug them into the same outles that a TV or other computerized electronic device runs off of as it can create dangerous peaks and surges in the outles that can fry sensitive electronics. You also need to be aware of the length of your power cord. A long power cord loses electricity and it is likely that your 50 foot long 14 gauge cord is only going to be offering 12 amps by the time it reaches your compressor. Underpowering your compressor will cause it to overheat and burns out the components of the motor causing premature failure. It is this “invisible” abuse that means most folks prefer to buy their construction equipment new so they can protect it by using larger gauge extension cords and plugging it in, close to the power source. If you are planning on moving it around, weight is a consideration. But how the weight is distributed matter as well. Most of the contractor-grade unites are made to be easily carried in one hand while you carry your air hose and power tools in another. Whenever moving your nailers and equipment, keep in mind that as long as there is air in the tank, it can power your nailer – even if the air compressor is not plugged in. Never carry your nailers and air hose while plugged in to the compressor. Disconnected all the hoses, and then carry them to the desitnation. Most of these compressors have bleed valves on the underside for letting the pressure out. This makes it easier for them to start on cold mornings. For example, gasoline-powered compressors can’t start unless the tanks are empty. If your compressor is having a hard time starting, consider draining the tank.